Rare D’veykus Reunion Benefit Concert! 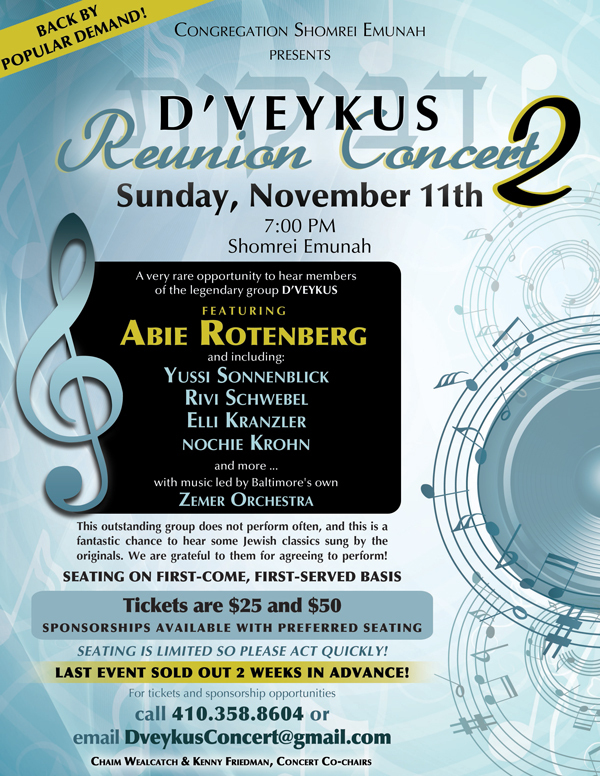 Congregation Shomrei Emunah (Baltimore) is ecstatic to host an extremely rare reunion of D’veykus featuring the special talent of Abie Rotenberg with Rivi Schwebel, Yussi Sonnenblick and Eli Kranzler! Please join us for an evening of magical songs that are inspiring and nostalgic in their familiarity and warmth. Tickets: $25 (back of shul); $50 (front of shul). Multiple sponsorship levels are available and come with guaranteed premium seating. Your payment is your reservation! Reservations can be made online – www.shomreiemunah.org or by calling the office at 410-358-8604. Email DveykusConcert@gmail.com with any questions or to request sponsorship. All proceeds benefit our shul!